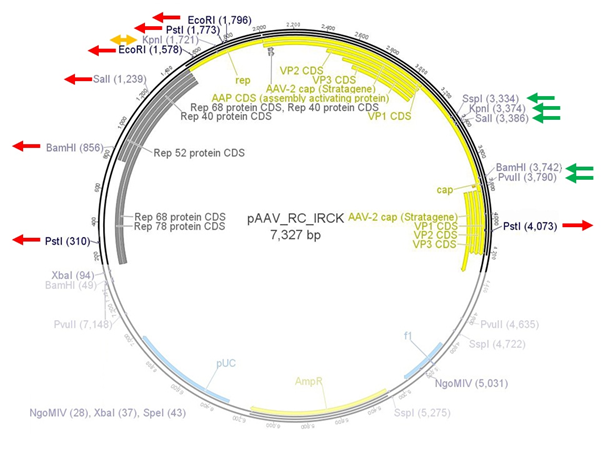 The Adeno-associated virus (AAV) consists of two open reading frames (ORF), rep and cap ORF. The four non-structural rep genes are driven by two promoters located at map units 5 (p5 promoter) and 19 (p19 promoter). Rep proteins are involved in genome encapsidation, regulation of gene expression and replication of the viral genome. Furthermore, in the absence of Rep proteins, as it is the case in recombinant AAVs, integration of the viral genome into the human genome is rare and random. There are several hotspots for integration of wtAAV genomes such as the human chromosome 19q13.42, known as the AAVSI site, but as well some other accessible chromatin regions for preferred integration have been found (5p13.3 and 3p24.3). Integration into the human genome is mediated by the two regulatory proteins Rep68 and Rep78 driven by the AAV p5 promoter. The proteins bind to the Rep binding site (RBS) which is located within the inverted terminal repeats (ITRs). The minimal consensus Rep binding site (RBS) GAGT GAGC is found within the ITRs and in the p5 integration-efficient element (p5IEE) of the p5 promoter (Hüser et al., 2010). Rep78/68 proteins possess DNA-binding, helicase and site-specific endonuclease activity located within the first 200 amino acids (Davis, Wu, and Owens 2000). Since the N-terminal region is unique to the larger Rep proteins, the two smaller Rep proteins possess other biological functions. Rep52/40 gene expression is driven by the p19 promoter which is located within rep ORF and the proteins are involved in encapsidating the viral genome into the preformed capsids. Gene expression of these proteins is suppressed in absence of adenovirus infection by binding of Rep78/68 to the p5 promoter. Gene expression of p19 and p40 is transacvtivated by the Rep proteins Rep78/68 during coinfection. In our terminology the term “RepVP123” encompasses the whole AAV2 genome excluding the ITRs. The rep locus comprises four proteins related to genome replication while the cap locus codes for the proteins VP1, VP2, VP3 and the assembly-associated protein (AAP), which are required for viral capsid assembly. Source of the RepVP123 BioBrick supplied within iGEM team Freiburg_Bioware 2010 Virus Construction Kit is the wild-type AAV2 RepVP123, as provided e. g. in the pAAV vector from Stratagene. In order to introduce the iGEM standard and additionally enabling the possibility to modify the viral capsid via integration of certain motives within the viral loops 453 and 587, a total of twelve mutations within RepVP123 (see Figure 1) and additionally two mutations within the pSB1C3 backbone were introduced by either Site-Directed Mutagenesis (SDM) or by ordering and cloning of specifically designed gene sequences matching the required demands. Modifying the pSB1C3 led to iGEM team Freiburg_Bioware’s variant of this backbone, pSB1C3_001. Figure 1 Mutations implemented into RepVP123 in order to establish both iGEM standard and loop insertion capability. Green arrows indicate integrated restriction sites, red arrows indicate deleted restriction sites. KpnI was deleted first and reinstated later. (see text). Table 1 Overview about all plasmids containing RepVP123 which were used by iGEM team Freiburg_Bioware 2010. Figure 2 Restriction sites within the wild-type rep gene sequence, which were removed via cloning of synthetized rep gene fragment into the plasmid. The red box indicates the region spanned by the synthetic sequence. Making the RepVP123 wild-type construct compatible with the iGEM standards required the removal of five restriction sites (see Figure 1). This was achieved using site-directed mutagenesis for PstI (position 310) and PstI (4073). The remaining three iGEM restriction sites EcoRI (1578), PstI (1773) and EcoRI (1796) were replaced by a synthetic gene fragment, since the rep ORF contained these restriction sites in close proximity to each other plus an additional KpnI restriction site which was also not desired (see Figure 2). This gene fragment was cloned into the rep gene using HindIII and SwaI, which are single-cutting restriction enzymes adjacent to the target area. Furthermore, BamHI (859) and SalI (1239) were removed, because these enzymes were required for genetically inserting the loop modifications in VP123. In order to implement the restriction sites necessary for targeting via loop insertions, the gene coding for the VP proteins was modified as well. The introduction of these restriction required up to four base modifications in a row, hence it was decided to synthesize this gene fragment and replace the wild-type sequence in RepVP123 as well. Figure 3 Restriction sites within cap sequence showing introduced loop insertion restriction sites into cap to enable cloning of targeting or purification motifs into both 453 and 587 loops. Again, the red box indicates gene sequence which was synthetized. To fulfill iGEM requirements, all plasmids need to be submitted in pSB1C3. Therefore, primers were ordered for amplifying RepVP123 containing all modifications done so far by PCR and cloning them into pSB1C3. Still, pSB1C3 contains two restriction sites for SspI and PvuII restriction enzymes in its CAT marker. Since these are necessary for cloning ViralBricks in this vector, the iGEM Team Freiburg_Bioware 2010 decided in agreement with iGEM Headquarters to implement a new standard for the pSB1C3 backbone which was named pSB1C3_001. Both restriction sites interfering with ViralBrick insertions were mutated to make SspI and PvuII single-cutters. Figure 4 Comparison of pSB1C3 (upper row) and pSB1C3_001 (lower row). Deletions of SspI and PvuII are marked by red boxes. RepVP123 containing both rep and cap synthetic gene fragments including the re-mutation of KpnI and the downstream p5TATA-less promotor was cloned into the newly constructed pSB1C3_001. Testing this newly assembled plasmid in cell culture revealed unexpected data: Not only did the newly assembled plasmid work (see Figure 5), but in comparison to pAAV containing the same RepVP123 construct, pSB1C3_001 showed an about 3 times higher transduction efficiency. Although exact reasons are still unknown, these results are probably related to the length reduction of pSB1C3_001 compared to the original pAAV plasmid of approximately 1000 base pairs. Figure 5 AAV-293 cells were transfected with three plasmids pHelper, pSB1C3_001_[AAV2]-Rep-VP123_p5-TATAless or pAAV_RC_IRCK and pSB1C3_[AAV2]-left-ITR_pCMV_beta-globin_mVenus_hGH_[AAV2]-right-ITR providing essential genes and proteins for producing viral particles. 48 hours post transfection, viral particles were harvested by freeze-thaw lysis and centrifugation followed by HT1080 transduction. mVenus expression of viral genomes was determined by flow cytometry analysis 24 hours post infection. Fluorescence is measured in surviving cells. Results showed functionality of RepVP123 within the pSB1C3_001 vector and additionally increased transduction efficiency. Shutting-down the natural viral tropism is essential for specific targeting of tumor cells and not infecting healthy cells. Therefore, the iGEM team Freiburg_Bioware 2010 decided to knock-out the viral natural tropism delivered by the heperan sulfate proteoglycan-(HSPG) binding site within the viruses 587 loop. The knock-out was cloned by designing primers containing the required base exchanges and performing a SDM. As before, this RepVP123 variant was tested in cell culture and evaluated as well by flow cytometry. Results show that mutation of HSPG-binding motif has severe impact on transduction efficiency, thus enabling a viral particle carrying this knock-out and additional targeting motifs, e.g. within the loops or presented via N-terminal fusion, to bind target cells’ receptors. Consequently, target cells are infected at a much higher rate compared to unspecific infection of other cell types within an organism (see Figure 7 ). 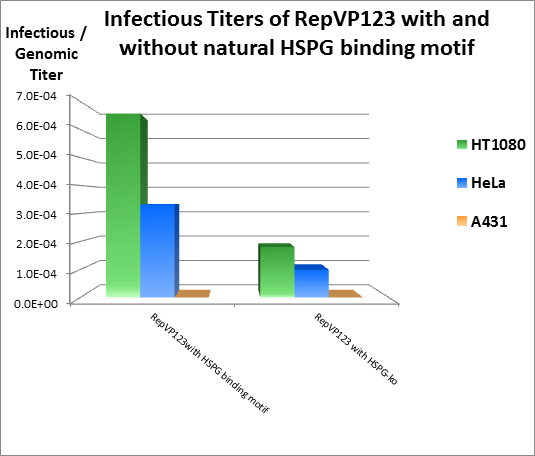 To quantify differences in infectivity, the infectious titer of viral particles made up of RepVP123 with and without HSPG binding motif was determined by qPCR (see Figure 8) for different cell lines. Results show that the implemented HSPG-knock-out verifies results obtained from flow cytometry: Infectious titers severely dropped compared to RepVP123 with an intact HSPG binding motif. Figure 6 Alignment of 587 loop within viral VP123: The upper sequence contains the HSPG binding motif (AGA, in red boxes), the lower sequence contains the HSPG-ko introduced by the iGEM team Freiburg_Bioware 2010 (GCT and GCC, blue boxes). Figure 7 Transduction efficiency of HT1080 cells measured by flow cytometry. Fluorescence is measured in surviving cells. Knock-out of HSPG binding motif greatly reduces transduction efficiency compared to RepVP123 containing the motiv. 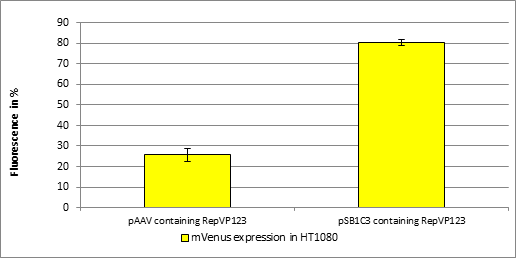 Figure 8 Infectious titers of RepVP123 with and without natural HSPG binding motif tested in different cell lines via qPCR. Shutting-down the HSPG binding motif reduces infectious titer in both HT1080 and HeLa cell lines. For A431 cells, no infectious titer could be detected via qPCR, which is probably related to the poor transduction efficiency of A431 cells. In contrast to the natural location of the p5 promoter, the iGEM team Freiburg 2010 provides the RepCap plasmid with a relocated p5 promoter. Downstream of the RepCap genes (see Figure 9 ), this p5 promoter lacks the TATA box element (AVIGEN, 1997). These modifications result in an attenuated expression of the larger Rep proteins leading to normal transcription of the Rep proteins driven by p19 promoter and enhanced expression of the Cap proteins, which are under the control of the p40 promoter. Furthermore, removing the p5 promoter downstream of the RepCap genes and deletion of the TATA box eliminates contamination with wtAAVs [Natsoulis, G., 1997]. Hence, alteration of the p5 promoter is useful for enhanced production of recombinant viral particles by attenuating repression of Rep78/68 and improving gene transcription of the capsid proteins and Rep proteins which are involved in genome packaging. 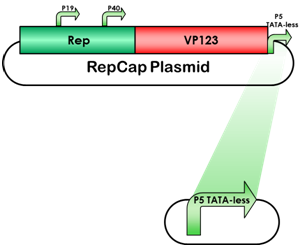 Figure 9 p5 TATA-less promoter located downstream of the rep and cap ORF. Natsoulis, G., United States Patent 5,622,856 (1997). Davis, M D, J Wu, and R A Owens. 2000. Mutational analysis of adeno-associated virus type 2 Rep68 protein endonuclease activity on partially single-stranded substrates. Journal of virology 74, no. 6 (March): 2936-42. http://www.pubmedcentral.nih.gov/articlerender.fcgi?artid=111789&tool=pmcentrez&rendertype=abstract. Hüser, Daniela, Andreas Gogol-Döring, Timo Lutter, Stefan Weger, Kerstin Winter, Eva-Maria Hammer, Toni Cathomen, Knut Reinert, and Regine Heilbronn. 2010. Integration preferences of wildtype AAV-2 for consensus rep-binding sites at numerous loci in the human genome. PLoS pathogens 6, no. 7 (January): e1000985. doi:10.1371/journal.ppat.1000985. http://www.pubmedcentral.nih.gov/articlerender.fcgi?artid=2900306&tool=pmcentrez&rendertype=abstract. Johnson, Jarrod S, Chengwen Li, Nina DiPrimio, Marc S Weinberg, Thomas J McCown, and R Jude Samulski. 2010. Mutagenesis of adeno-associated virus type 2 capsid protein VP1 uncovers new roles for basic amino acids in trafficking and cell-specific transduction. Journal of virology 84, no. 17 (September): 8888-902. doi:10.1128/JVI.00687-10. http://www.pubmedcentral.nih.gov/articlerender.fcgi?artid=2918992&tool=pmcentrez&rendertype=abstract. This construct was used to produce viral particles in cell culture. It could be used either to produce viral particles containing only VP proteins or mosaic viruses which are an essential part for targeting and killing tumor cells. This can be achieved e.g. using BBa_K404163 as targeting construct and BBa_K404122 as gene of interest containing mGMK_TK30 which, in presence of ganciclovir is able to kill tumor cells.